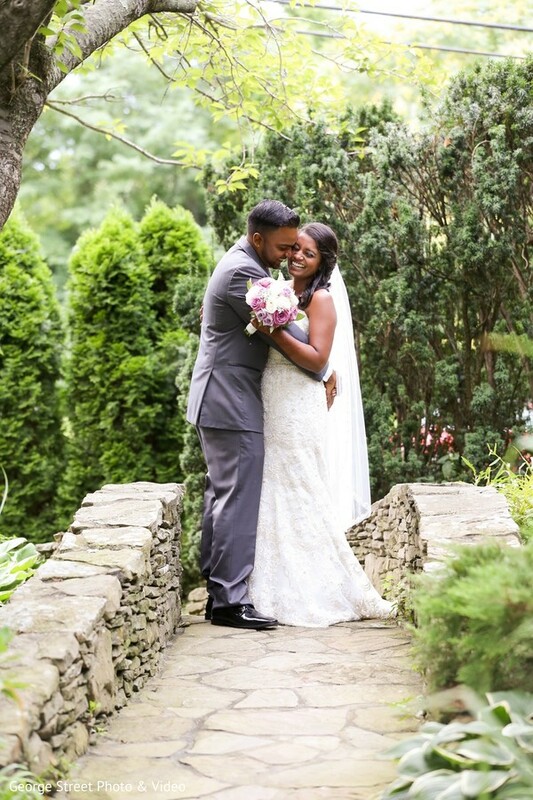 We are back with Gaitree & Kenory's marvelous fusion wedding! 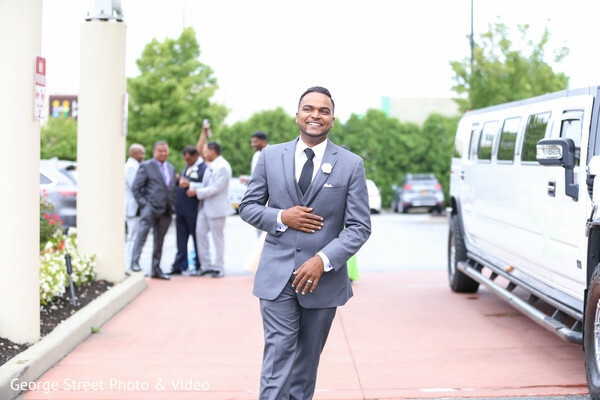 I can't wait to share with you the details of the grand reception and the romantic photo shoot that went on after the ceremony, so let's get right to it. 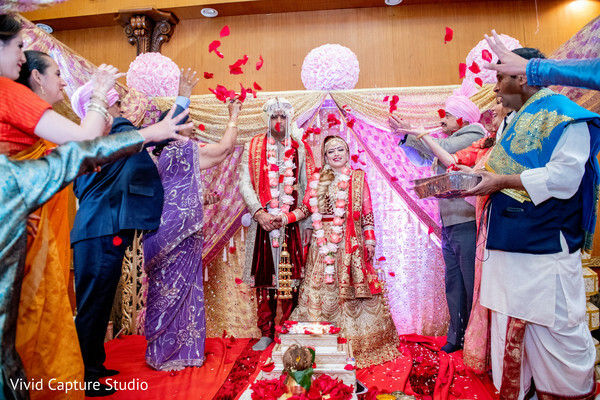 The Westbury Manor hosted the newlyweds and their guests for the bash and the place was looking heavenly, just the way it should be when a Maharani is getting married. The team from Fern 'n' Decor was recruited to craft the floral arrangements and decoration of the venue, and they nailed it completely. A true success! 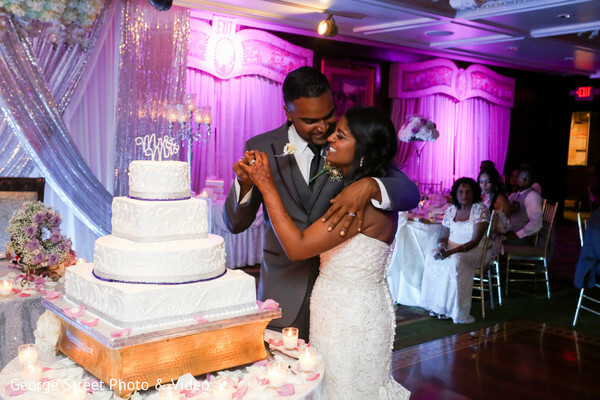 Our couple also wanted to pamper their loved ones after an evening of flying emotions, so for that, the incredibly delicious culinary sweets from Francesco's Bakery made their appearance and it is safe to say that the guests got the sugar rush they needed to tear the dance floor apart. The one in charge of making that happen? DJ RAJ Entertainment & Event Lighting of course. The fun pro brought the house down with a fine selection of songs that left no one seated. 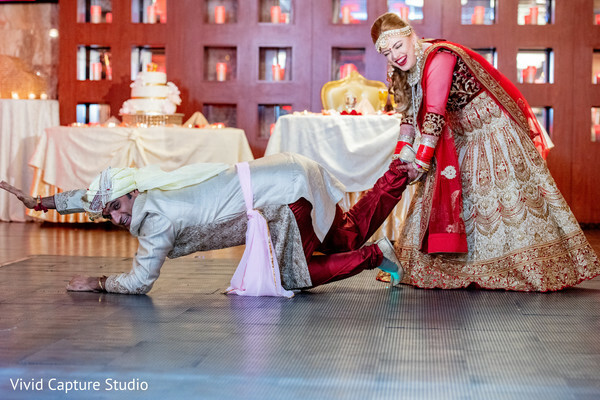 Want to see the rest of today's nuptials? 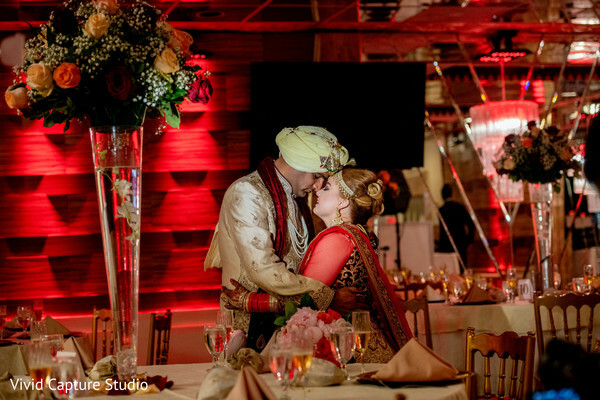 Join us in our gallery captured by George Street Photo & Video! 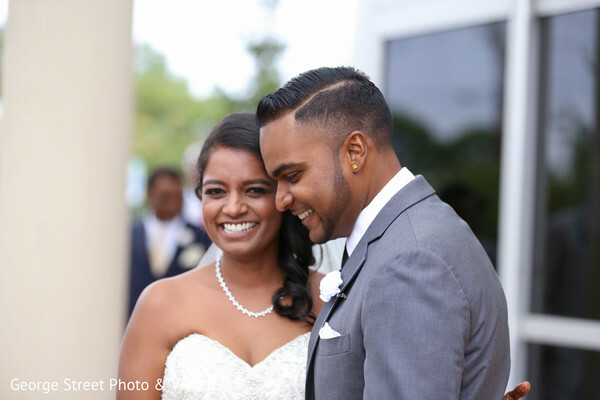 Our story began in June 2014 when Gaitree first met Kenroy's best friend and best man, Devon at a wedding. Although Kenroy wasn't there, in epic wing man fashion, Devon set up a double date for us with him and his wife, Sara, who also went to high school with Gaitree. 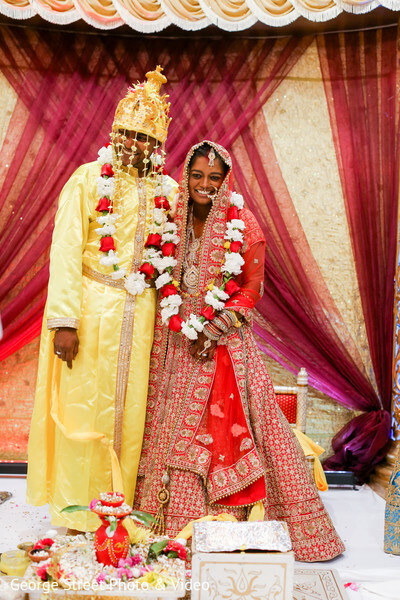 A week later, Kenroy and Gaitree crossed paths for the very first time at a restaurant in Long Island, N.Y. and the rest, as they say, is history. After two and half years of dating, we were engaged on March 16, 2017 while on vacation in New Orleans. I knew Kenroy was the one when I started to realize he saw me the way I wanted the rest of the world to see me. We understood each other and brought out the best in each other and that's when I knew I wanted a future with him. Kenroy and I were on vacation in New Orleans, I was just getting ready one morning in the hotel room. This was about halfway through our trip, and I thought I was getting ready for just another day of sight-seeing and exploring the city. But when I turned around from the mirror, Kenroy was on one knee and asked if I wanted to marry him and I said, at first, are you serious? Then of course, yes. It was simple, intimate and just the two of us. I wouldn't have wanted it any other way because he knows I get very shy in big, opening settings when I'm the center of attention. 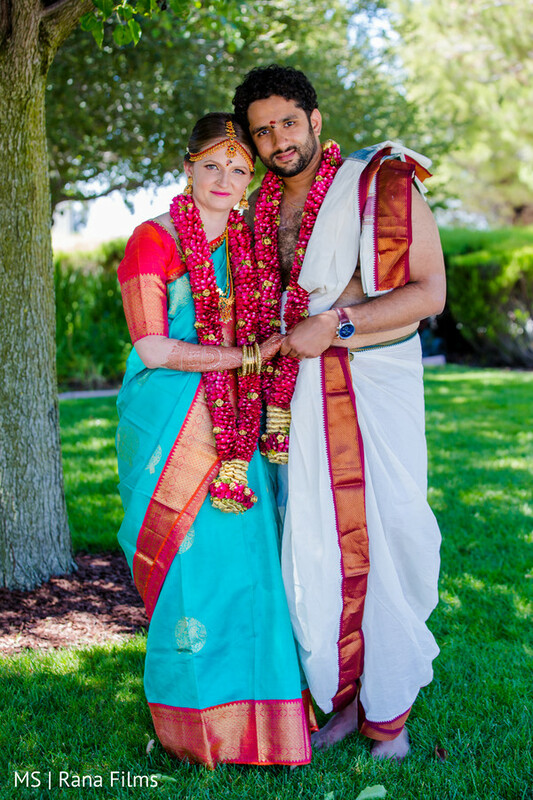 My bridal lengha was custom made from India. I knew I always wanted a traditional red wedding dress. And when I walked into the store and saw it on the mannequin, I knew I had to have it and nothing else would do. I tried on several outfits but kept coming back to my first choice. It turned out beautiful and I loved wearing it. I felt like true royalty in that outfit, as every bride should on their wedding day. The best moment of the wedding had to be our entrance into the reception. 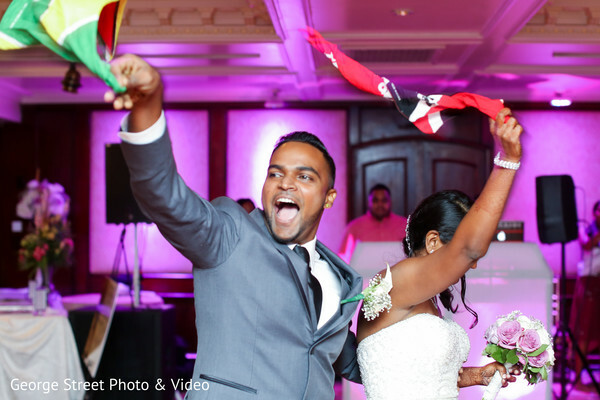 We wanted to do something to reflect our Trinidadian and Guyanese cultures so we walked in waving our flags with our immediate families also waving their flags to Soca music. It was like we were at a carnival. 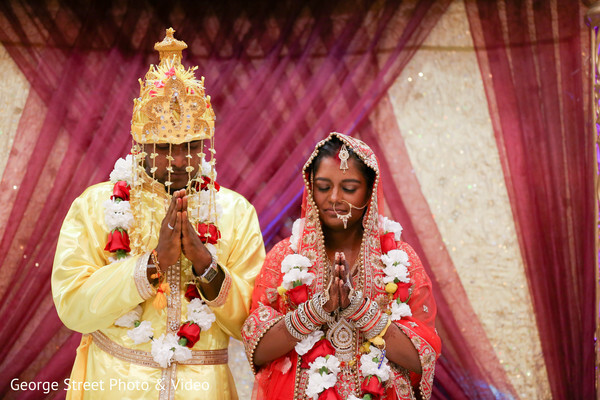 I think it reflected the marriage of our West Indian culture perfectly. These are the words of wisdom I wished someone had told me sooner. 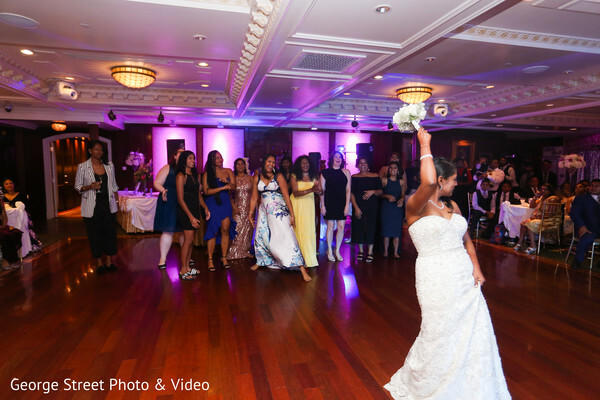 At some point during the planning process, it may seem that picking the right flowers, decorations or whatever decision is stressing you out at that moment is going to make or break your wedding. It may even be causing you and your fiancé undo conflict but at the end of the day, no one will remember what color the decorations were or what the flowers looked like, the only thing they will remember about the wedding, is that they had a good time. Every day a brand new feature, Maharanis, stick around! 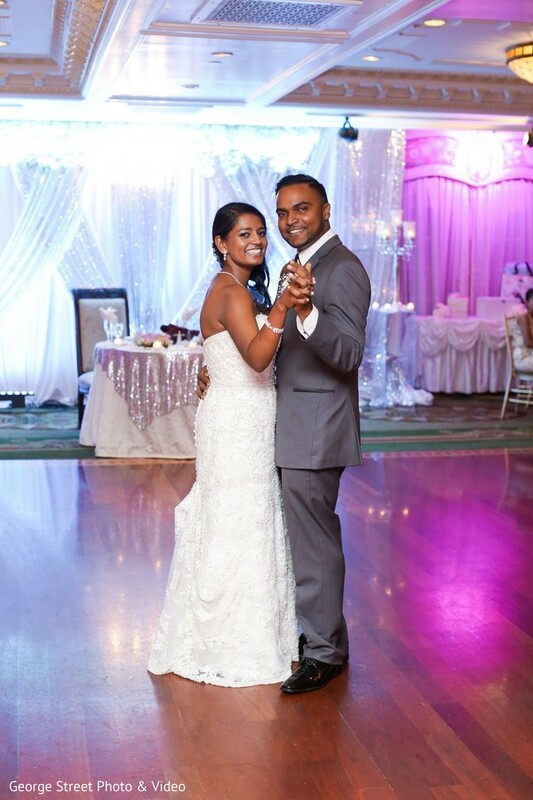 DJ RAJ Entertainment & Event Lighting and Francescos Bakery are members of the Platinum Guide. Love what you see? Explore their portfolios. A brand new day is here, ladies, and that means a brand new feature for our senses! Today, our glam and charm plane lands in the amazing and busy New York for Gaitree & Kenory's enchanting fusion wedding. 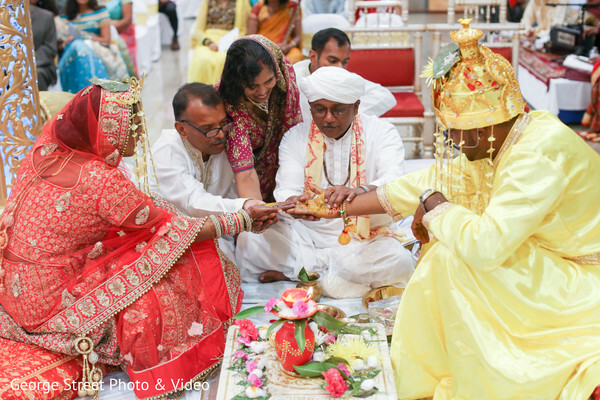 The Hindu Temple Society of North America Community Center housed the ceremonial rituals we will see, they were absolutely heartwarming and mystic. The gorgeous Maharani Gaitree beautifully flaunted a breathtaking lemon chiffon lengha that totally blew my mind because of its minimalistic style. 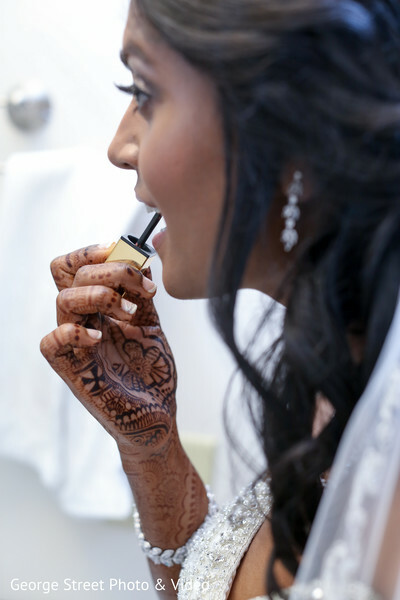 It truly highlighted the delicate features of our bride, making her look even more stunning for her dreamed day. 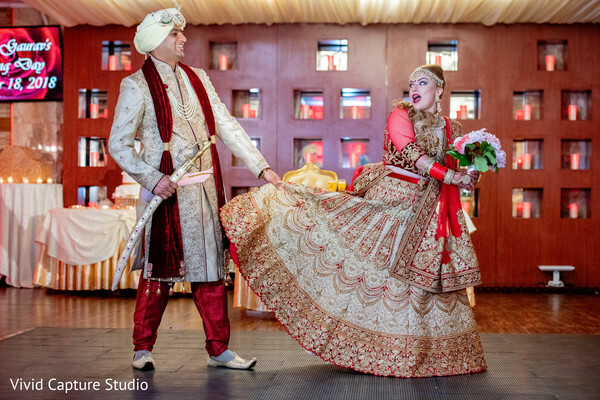 The classic and traditional red and gold lengha couldn't be missing from the spree. 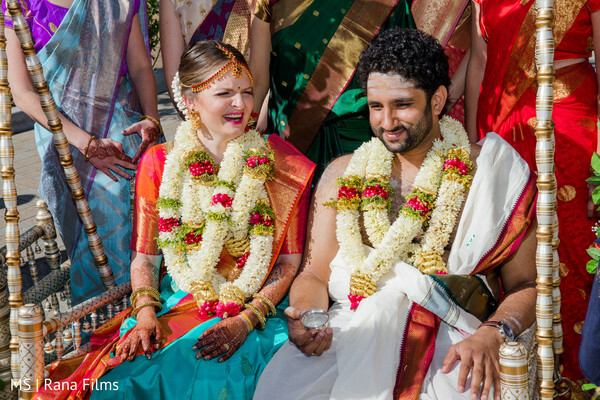 The bride glowed in it during the vows and the quintessential Hindu commitment look was indeed complete. All the details are in our gallery thanks to the creative work of the team from George Street Photo & Video. 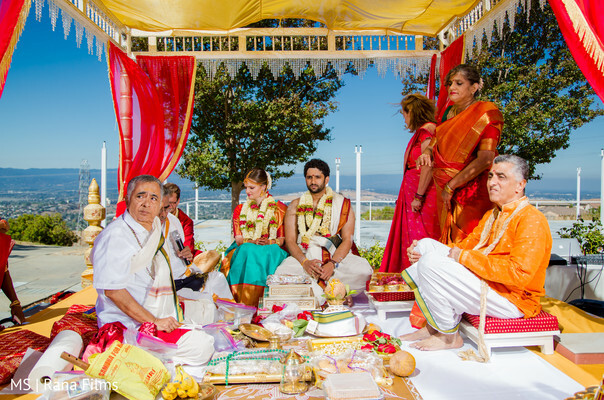 So, let's get right into this beautiful fusion wedding! 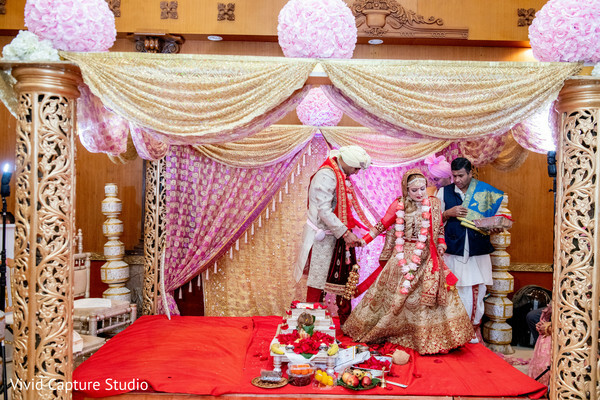 After the incredible contemporary fusion wedding ceremony, the newlyweds and guests moved to the reception hall of The Sterling to start the joyous bash Sofia & Gaurav had prepared. The place was looking magical to greet everyone and was also set to give an experience of almost being in both India and Costa Rica. So creative! 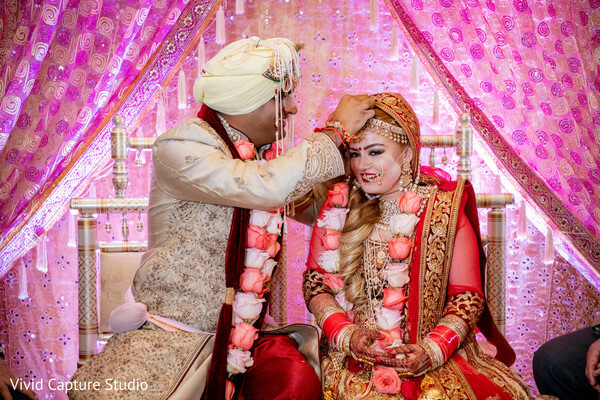 Maharani Sofia didn't even need extra touch-ups after all the emotion of the ceremony. Not a gram of glam was lost and that was also thanks to the amazing work of Looks by Jassy who assisted with her hair and makeup look! Seriously, our bride knew she needed the best so she got the best. After all the choreographies and dancing that went on, the guests were needing a sugar rush to keep on dancing and having an amazing time. Lucky for all, the team from Francesco Bakery know their game to perfection and brought the sweet wonders that make them, the go-to pastry shop. Fun was assured all night long! Want to see the rest of the spree? 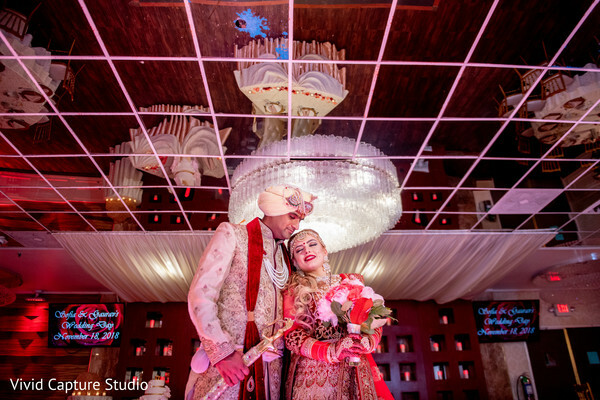 Check the full gallery thanks to Vivid Capture Studio and get that inspo going! We met in college in New York while studying for our Master's Degree. 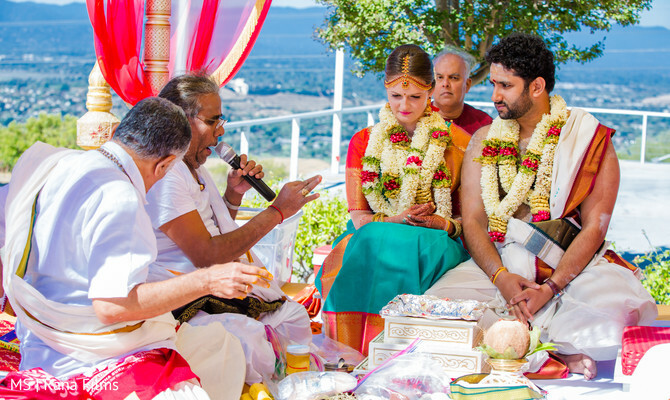 We had spoken to our parents on Diwali 2017 and they both were incredibly happy to hear that we wanted to be together and gave us their blessings. Our official proposal happened on our Ring Ceremony in India! On February 2018 in front of both our sets of parents, his brothers, wife and fiance and extended family, he bent the knee! And put a ring on it and I put a ring on him as well! 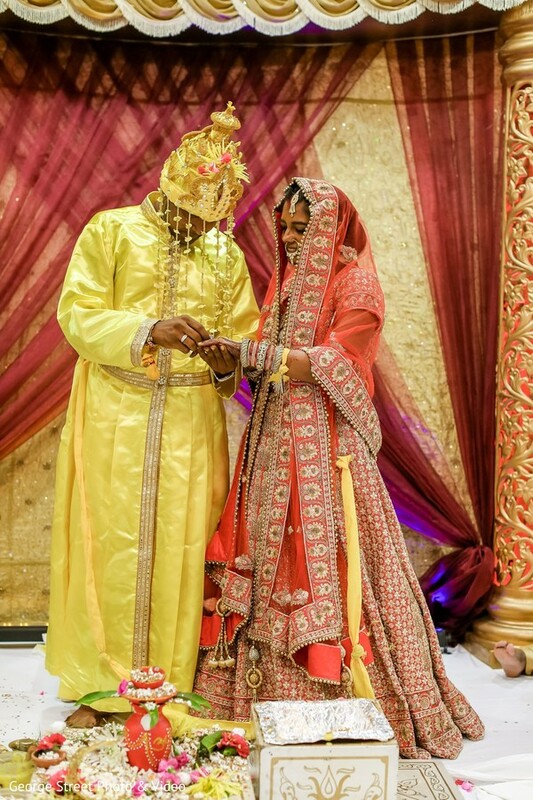 I went to a couple of Dulhan Expo's in New Jersey and that's where I met Neha from Ask Neha Now. I met several other wedding planners but something just clicked with her; especially the part where she is incredibly attentive to details and organized. 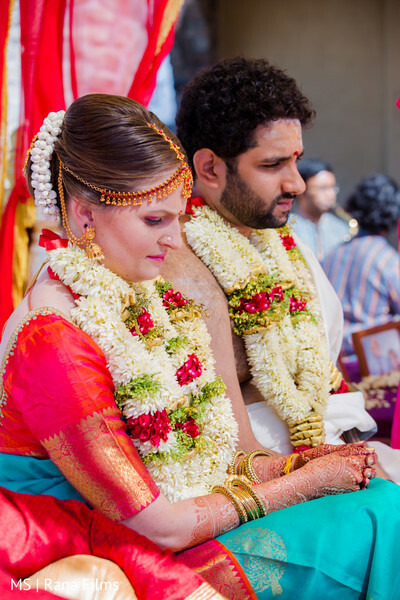 Once we decided on the package, I set out to look for venues while my fiance was "stuck" in India. I went to a couple of places that I really liked but they weren't suited for the type of function that we wanted to do. 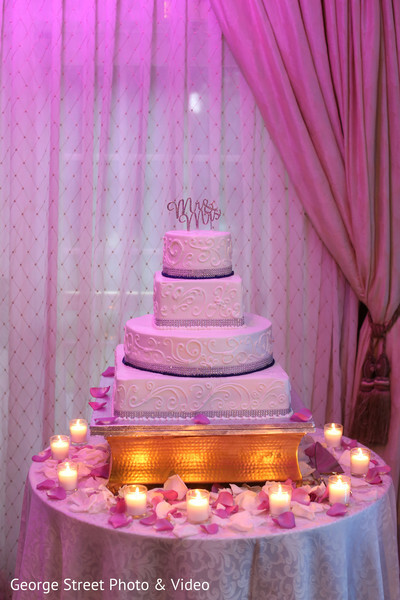 I emailed another place and almost canceled the appointment but I'm so glad that I didn't as it was The Sterling and the place just blew my mind; the best part was that their packages included decoration, DJ, Video & Photo, and the food. My fiance and I had a fun time going to The Sterling several times for food tasting and decor picking. 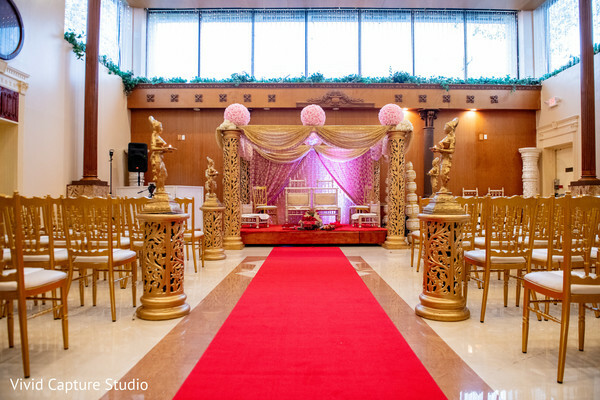 Our Sangeet place was another one of my initial choices for the wedding but for us, it was better suited in terms of Sangeet. The people at Bellozino were very attentive and we got a great package as well with decoration, photo, video, and food. 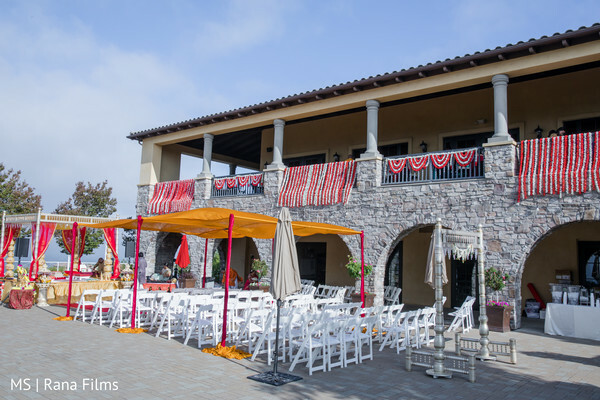 We were so lucky to find two high-quality venues which included most of the vendors; that really saved us time. 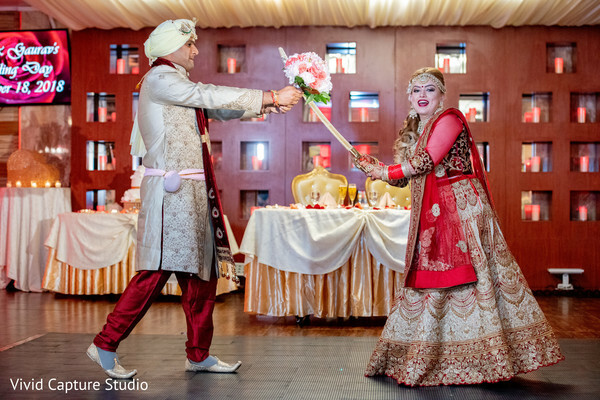 In terms of makeup, I was referred to Jassi of Looks by Jassi by Neha; I was hesitant to make the trek out to Staten Island but it was oh so worth it! 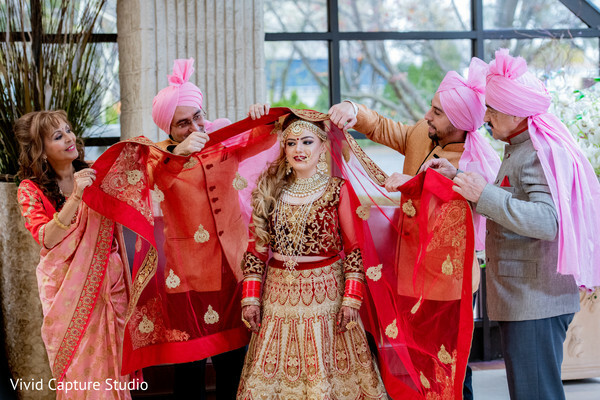 I consider Jassi my wedding's fairy godmother; she was so kind and listened to what I wanted and she even held the phone so I could facetime my mom during the makeup trial. She's a true artist, a professional and a warm-hearted person. She was also able to contact the person who did the hair for my Mother in Law and Sister in Law. 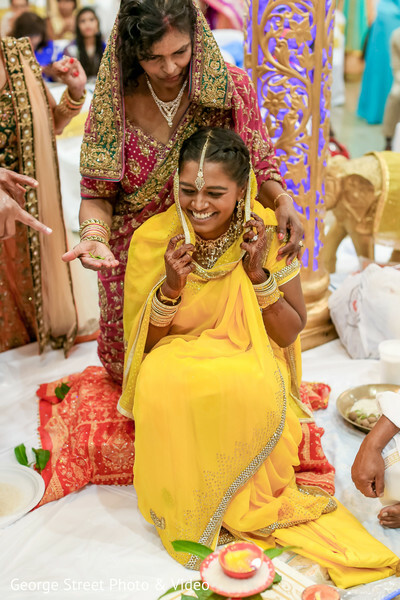 I got the saree for the Sangeet at Manyavar & Mohey as well; one of my favorite colors is turquoise and I knew I just had to have this gold and turquoise saree for my Chunni ceremony. My Mom was amazing at helping materialize what we wanted in terms of gift bags for the favors; she met with different vendors in Costa Rica until she found "Mas Que Bordados"; Vanessa was incredibly patient; she created different logos and gave us thread color options and patiently opened each jute bag to add the logo. Mom also coordinated with Cafe Britt the shipment of Costarrican coffee for the favors and the chocolate covered fruit and coffee treats for the Sangeet. 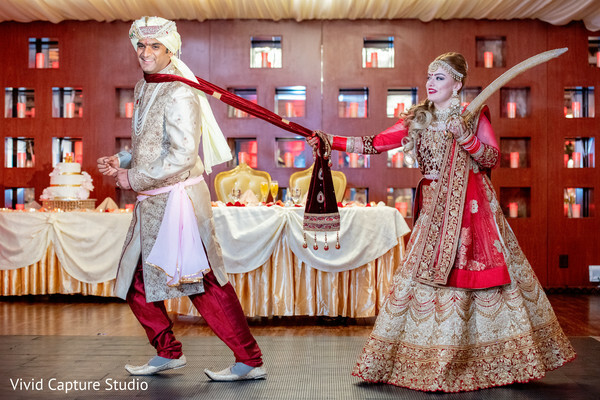 She also spoke with "Munecas de Trapo Raquel" to create felt dolls of me and my Groom; mine had the typical Costa Rican attire and his had a Nehru vest with the Groom turban and spoke with a wood carver to create 2 toucans representing us to be displayed at the Sangeet. The "Carnival Hour" is something that happens in Latin American weddings; this is where people get masks and necklaces and whistles and we all go around doing like a conga line; we decided that this would be a fun addition and a surprise to our Indian guests so my mom purchased the masks and whistles, I got the necklaces online and got our special masks for me and my Groom. As an additional fun touch on the Sangeet night, I purchased temporary tattoos of the Costarrican and Indian flags. We also reached out to wedding cake topper on Etsy & Instagram for our elephant cake topper; We boh love elephants; she was able to customize the flower and bowtie with my choli color. 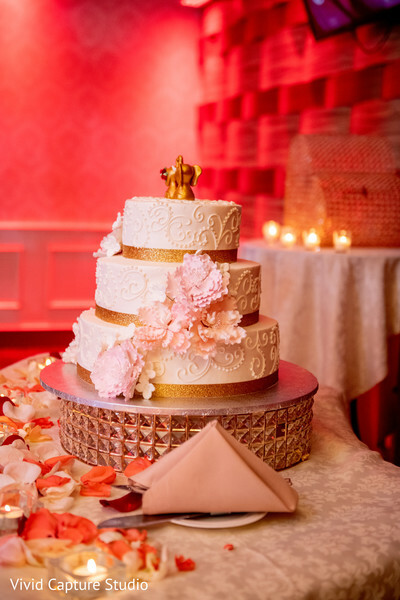 The cake was made by Francesco's bakery; we wanted a classic Italian romantic style cake with peonies as for Latin Americans peonies are auspicious. Both our "save the date" and invitations were made with plantable paper from ForeverFiances; we chose the Ganeshji design for the Invitation and a peacock feather for the save the date. The red tape that the groom cut and the Dulhan Ke Saheli pins that the bridesmaids wore were purchased after I did extensive research on decoration and details and I got them from DesignTukTuk. 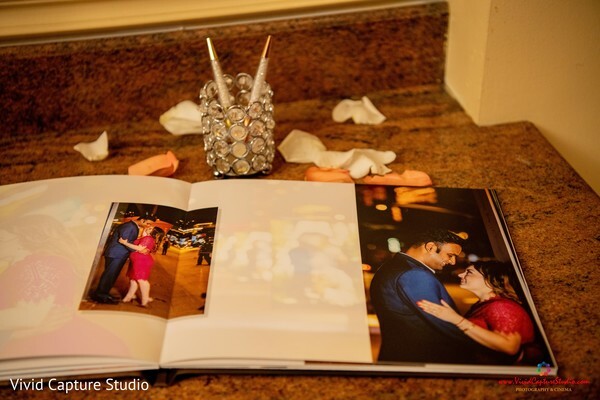 I also reached out to Apoorva from LittleIndia Etsy who created our wedding program. We got a rough draft from the Pundit; I rewrote the program, added a few details and Apoorva created the images next to each step. In terms of color scheme, I chose orange for the bridesmaids and bridesmen! 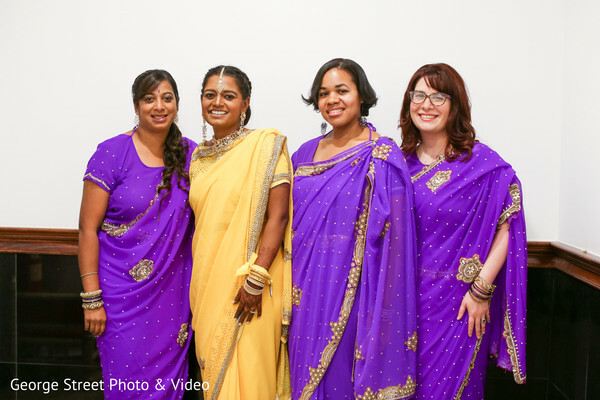 The ladies wore orange sarees and the lads wore Nehru jackets in orange color. 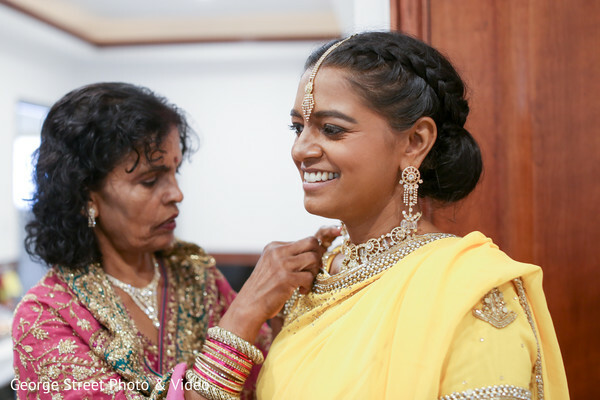 For my mom, I knew I wanted her to wear a silk saree so we went with a color that wouldn't clash and for y dad, I got a Nehru jacket with a red detail similar to my lehenga. I was leaning towards blue in the beginning, even ordered some fabric from India but it didn't appeal to me as it didn't make me feel like a Bride. We went to Manyavar & Mohey in New Jersey and I saw this beautiful gold lehenga with embroidery and a few accents in red and I just fell in love. I didn't want to wear a completely red outfit or a completely gold outfit. I tried a couple and face timed my mom from the store. Once she saw me in the one I had originally liked she started crying and I knew that was the ONE. Sharing the planning with my fiancee. He was incredibly involved, giving his opinion and suggestions and we were able to truly put our stamp in the wedding. 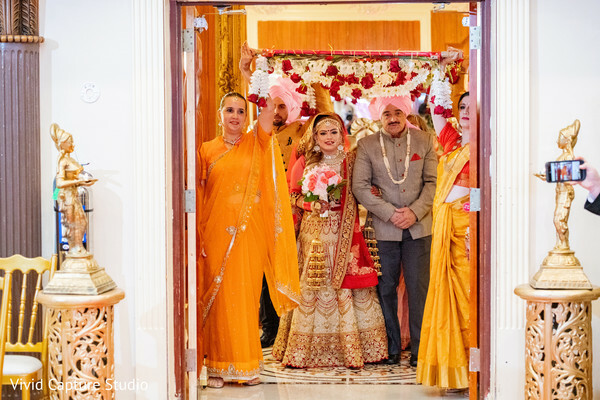 We had guests from many different places in the world and I have to say that they all enjoyed how we brought our cultures together; despite it being a Hindu religious ceremony we had Costarrican touches throughout the Sangeet and the Reception. The coffee lovers enjoyed the coffee; everyone was gushing about our wedding favor bags which contained a guava candy from Costa Rica, a small bag of coffee and 2 Ladoo. They had so much fun at the "Carnival Hour" My very picky Indian friends loved the food And I think everyone enjoyed the special dance I did after our Couple's Dance which was fun but we botched it a bit. When the chapel doors opened and I was about to begin walking towards the mandap and I saw my fiance wiping tears from his eyes. For our Sangeet Night, we had a loveseat and two small stools next to it. 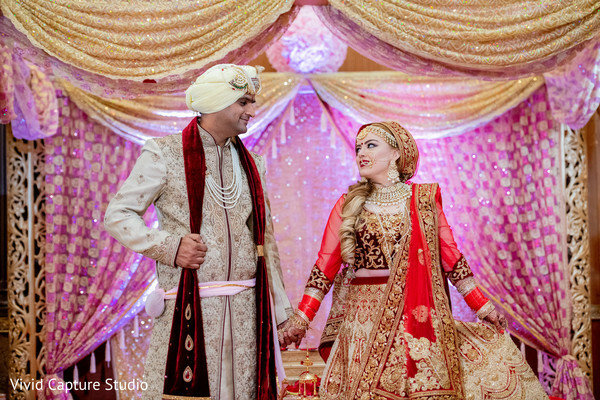 We chose gold and red to be the backdrop colors even though those are not the "Traditional sangeet colors" but such is our aesthetic. The signature look of this decorator is a red sphere inside an oval jewelry looking metal shape. We had 3 dances prepared for that night. Since I used to be in Bollywood dance lessons with a few of the ladies I asked 2 of the bridesmaids to join my 3 dancing friends into doing a dance, they danced to Eena Meena Dika, Mere Hathon and Rangilo Maro Dolna (the choreography was created by Shachi Phene founder of Noor Dance Academy in NYC and I tweaked a few things to make it easier for the non-dancers. The second dance was by a friend and her daughter they danced to Mahi Ve and Nagada Sang Dhol. The third dance was with me and my dancing friends; we danced to Kala Chashma and Banno; we used sunglasses as props on Kala Chasma it was very fun!. We had a Mehndi artist @sabrinahenna doing mehndi for the guests. We also had at the entrance a table with the chocolate covered fruit and coffee beans, the flag stickers, the toucan and the ragdoll couple. Breathe! Breathe! Breathe! Be relaxed and assertive but make sure you have a clear direction of what needs to be done so that you aren't running at the last minute. Enjoy the process as much as you can, make sure your voice is heard and don't worry about ruffling a few feathers; it's your day after all! I purchased bouquets for the bridesmaids at Home Depot :) Peonies. 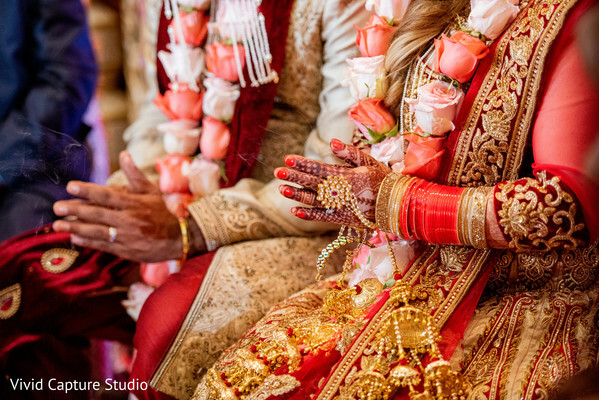 The chaadar was built with roses and carnations, this was done by Pooja of The Sterling. 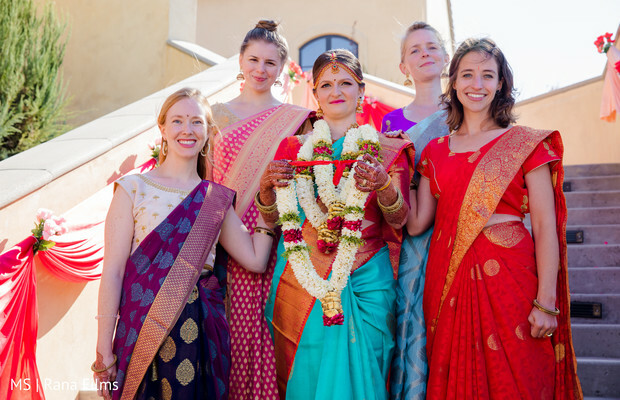 The malas were made of light pink and coral roses and my bouquet was made with real Peonies as well. 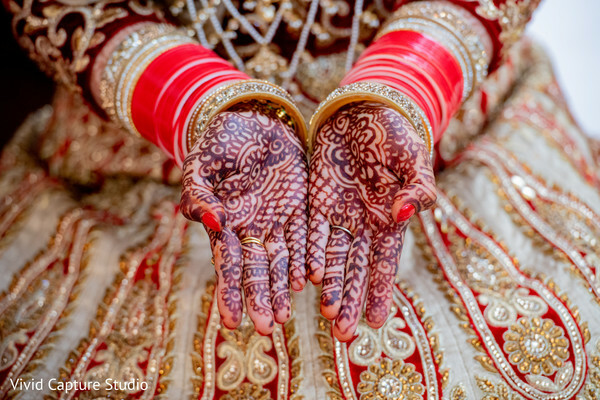 My Bridal mehndi was done by @SabrinaHenna and it incorporated the elephants as well. 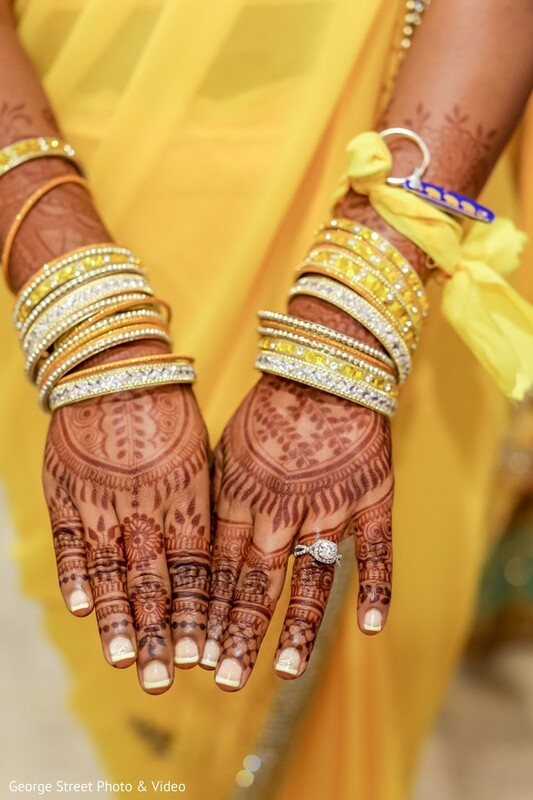 In terms of jewelry, I wanted good quality jewelry and did some research; finally, I began my communication with Akanksha, the owner of Naiyrah @nayirahofficial, where I purchased my entire bridal set. 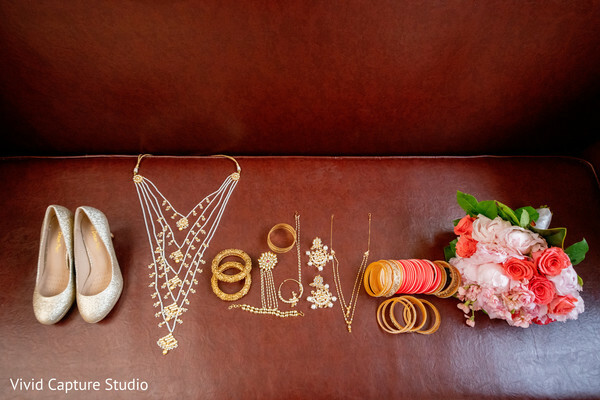 I was so happy with the quality of the products that I agreed to them doing a spread on me in their Instagram so my photos are there together with a few Bollywood Celebrities I thought that was a fun fact :) My lovely bridesmaids purchased the Kalire for me and my parents got the choora as well. 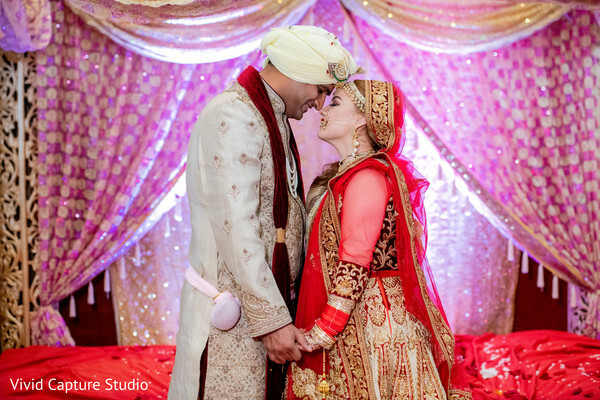 Vivid Capture Studio, Looks by Jassi, Francescos Bakery and Ask Neha Now are members of the Platinum Guide. Love what you see? Explore their portfolios. We are up to a great start of the week, ladies! 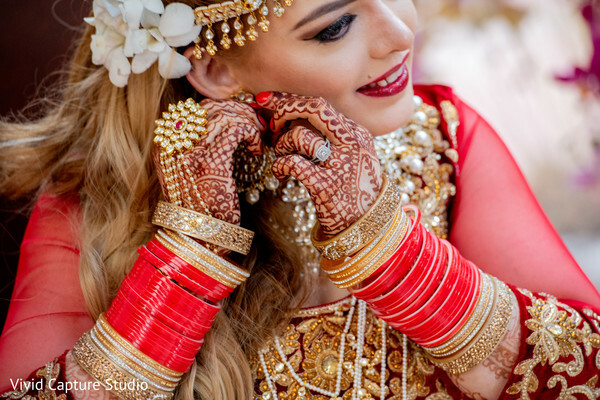 With your batteries fully recharged, it is time to dive one more time into the amazing and glamorous world of Indian weddings we love so much. 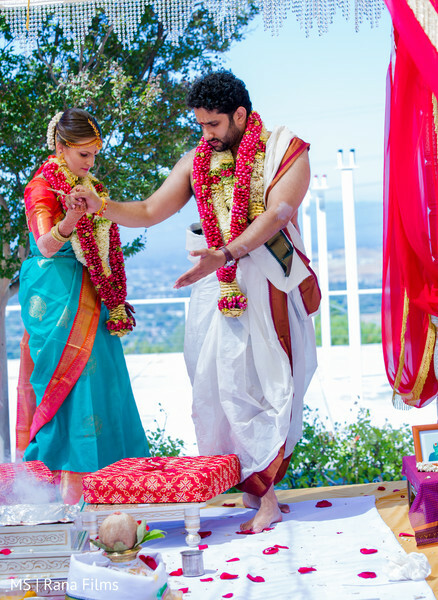 Today, a Costa Rican beauty meets a Hindu Prince and the result is this incredible contemporary fusion wedding we have for you. Both cultures were mixed in the most beautiful and creative way possible. We even heard the guests were absolutely loving the world-known Costa Rican coffee that came inside the lovely favors! 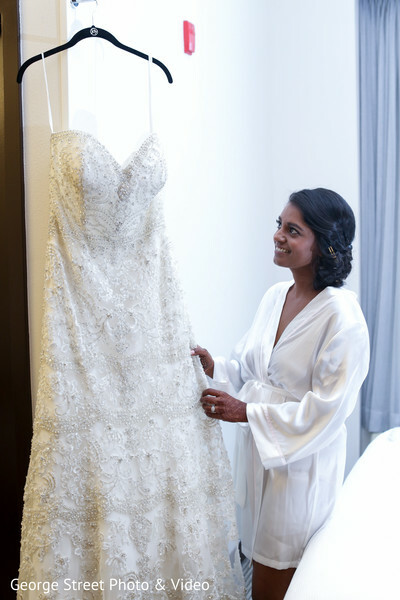 Our beautiful bride knew exactly what she wanted for her dreamed day and for that, she needed the pros. 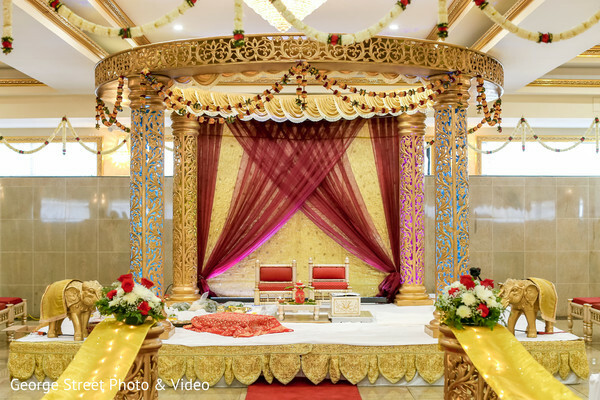 The planning expert from Ask Neha Now answered the call like they always do, and assisted Maharani Sofia with the planning and design of the ravishing nuptials. 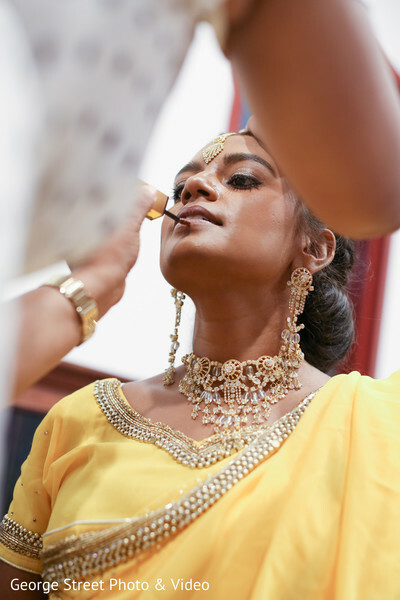 Looks by Jassi was also part of the pro team, she glammed up our bride and turned her into a beautiful Maharani. The talented team from Vivid Capture Studio is of course behind the enchanting images of today's gallery, so be sure that you are up for a grand glittering ride, ladies! Stay with us, ladies, a glamorous reception is on its way!